"There's a serial killer on the loose… What else could possibly be this exciting?!" Gunpowder & Sky has put out the first teaser trailer for filmmaking collective RKSS' new film Summer of '84, which is premiering at the Sundance Film Festival this month. This film comes with quite a similar pitch to many other projects these days: it "delivers the camaraderie, adventure, joy and nostalgia of The Goonies and Stand By Me while four boys chase to uncover a mystery (ala 'Stranger Things')." The main cast is lead by a group of four young kids, and the film stars Graham Verchere, Judah Lewis, Caleb Emery, Cory Gruter-Andrew, Tiera Skovbye, Rich Sommer, Jason Gray-Stanford, and Shauna Johannesen. This really does look like Stand By Me meets "Stranger Things", but hopefully it has something to unique offer on its own. Have fun. After suspecting that their police officer neighbor is a serial killer, a group of teenage friends spend their summer spying on him and gathering evidence, but as they get closer to discovering the truth, things get dangerous. 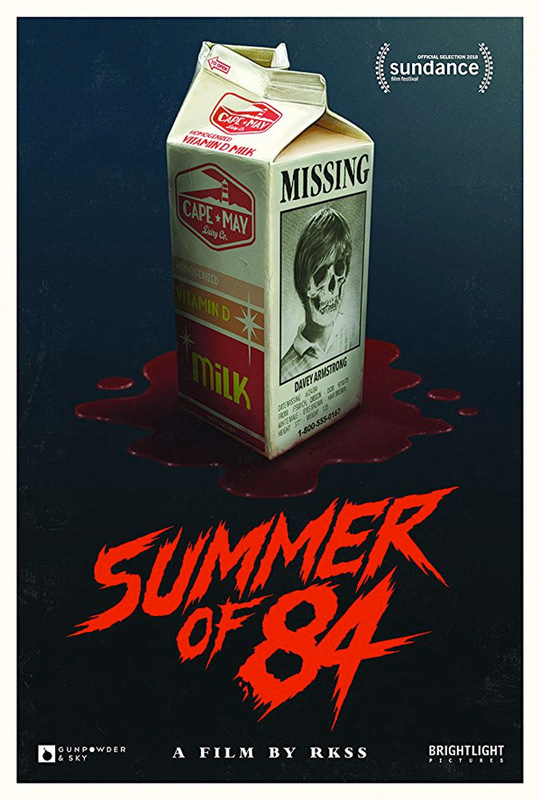 Summer of '84 is directed by the filmmaking collective known as "RKSS" from Montreal, made up of François Simard, Anouk Whissell, and Yoann-Karl Whissell. Their first feature film Turbo Kid debuted at Sundance in 2015. The screenplay is written by Matt Leslie and Stephen J. Smith. This film will premiere at the 2018 Sundance Film Festival this year in the Midnight category. It will then be released by Gunpowder & Sky, but it doesn't have any official release date yet. Stay tuned for updates. First impression?